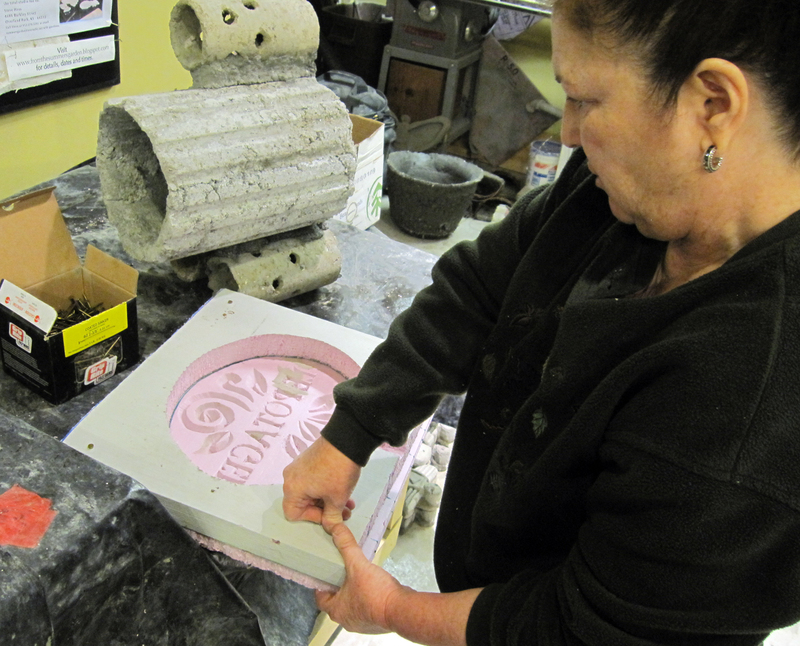 The most important activity in this workshop is creating the mold from rigid foam. It is relatively inexpensive, considering the price of mold-making materials, and is easy to shape and sculpt. Words and short phrases are popular features on garden stakes because they help to re-inforce the stake as a focal point in your garden. 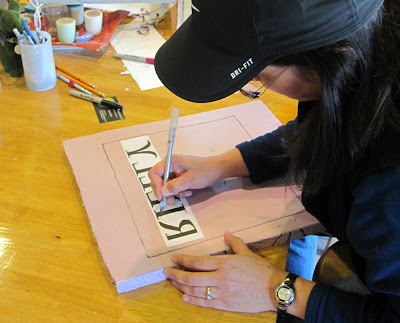 Sharp craft knives are used to carve the lettering as well as the accompanying designs. 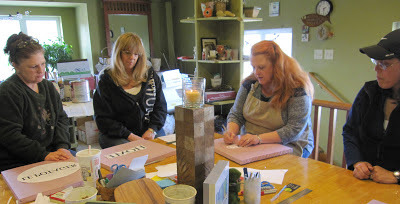 Watch our studio assistant, Nathan, create a garden stake from this workshop! In the Fairy Garden Workshop, we first make a large trough to hold soil which serves as the stage for the house, fairy garden and accessories. 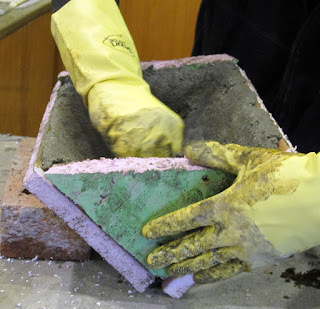 Then, we construct a mold that will become the house complete with a door and windows. 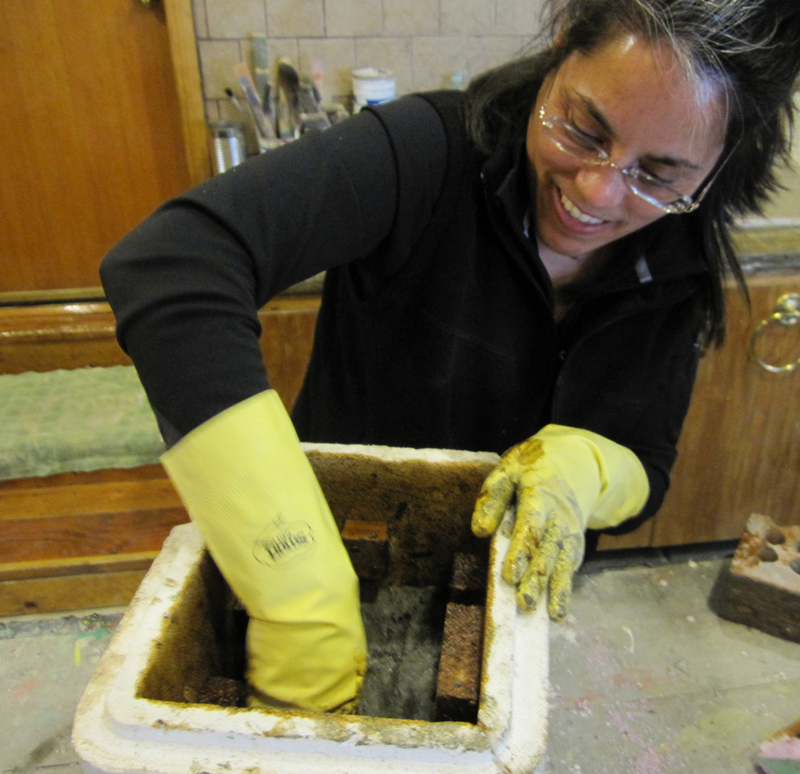 Trish is packing her house mold with our fine recycled paper hypertufa mixture. 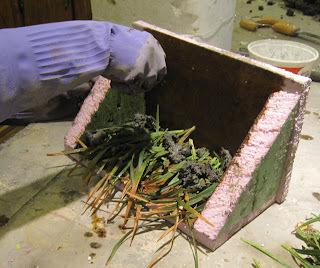 The roof mold is made and filled with the same tufa mixture. Jane wanted to make a thatched roof, so I ran out to the pond and cut some Liriope leaves to get the effect. You can see how she packed the tufa right on top of the grass. 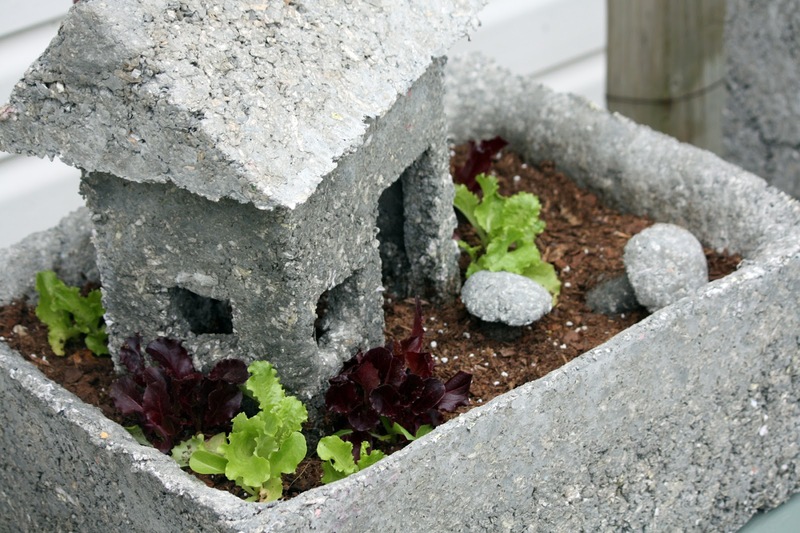 After the trough, house and roof were finished it was time to create accessories including mushrooms, birdbaths, stepping stones and stumps! 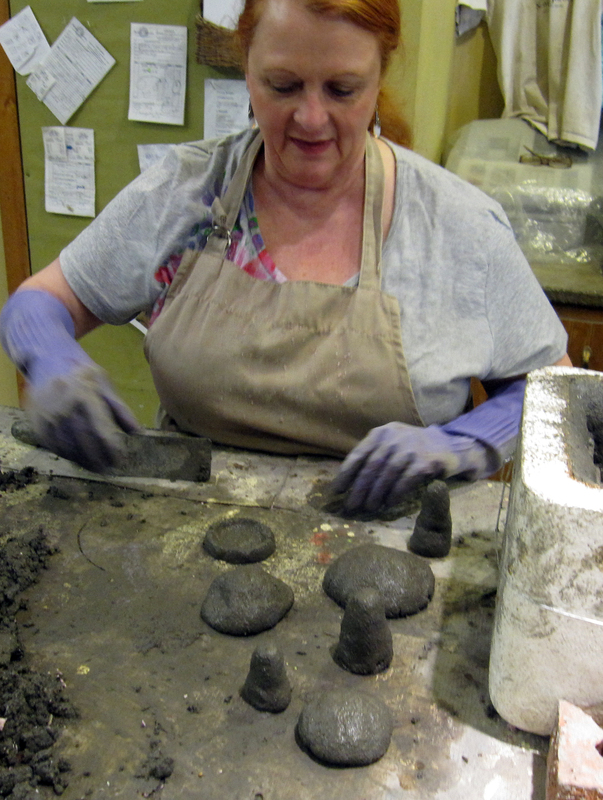 These are what the components look like after they are unmolded and have yet to be finished with color and details. These gardeners will have a functional new piece of art to add to their gardens. 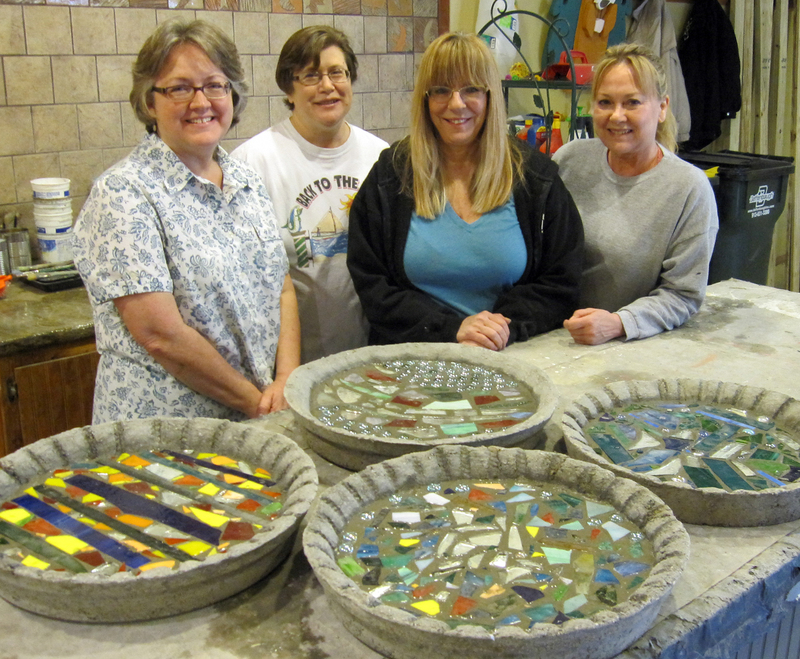 In less than 2 hours they created these beautiful mosaic bird basins in our Bird Basin Creative Workshop. The colored glass is repurposed scrap from a stained glass artist and old mirrors. Creative Workshops are schedule all through the month of February and into March. You can join in the fun too. Take a look at what you can make in less than two hours in the column to the right!